Magic Science comes with nine interesting activities that teach tricks using chemical reactions. Create your own wizard wand, make your own magic hat, make ordinary powders mystically foam and change color, create your own test tube crystal ball, and more . (Supervision required). If you’re looking for a unique DIY gift, this Knot-a Cactus Plush project would be perfect. It comes with pre-cut and pre-punched fleece and felt pieces, two pillow shapes, decorations, stuffing, and instructions. Dig in the dirt to find ten semi-precious gemstones (not as easy as it sounds) then use the activity booklet (included) to identify them and complete different puzzles and challenges. Kids will receive a lesson in geology, practice patience, and working with others towards a goal. The Brainiac Game is an educational board game in which players are required to answer a question about five different subjects (Science, Math, Arts, Reading, and The World) to win the game. The question cards are set up in a way where each player gets asked questions corresponding to their current grade in school. Fun game for the whole family! Dohvinci On The Go Art Studio is a cool new way to create and design art work. It comes with case full of art supplies, stencils, and colorful DohVinci drawing compound. The Dovinci compound is a mixture of modeling clay and paint that lets you create flat, swirled, and textured patterns. If you don’t have Rush Hour yet, its a must have. Rush Hour is a 1 player strategy game that requires problem solving, working memory, and perception. The goal of the game is to solve each challenge by getting the ice cream truck out of traffic by moving the cars up, down, left, and right. It’s really a classic! Goobi is an open-ended magnetic construction toy that comes with a set of bars, balls, and tripods (amount depends on the set you choose). Playing with construction toys helps develop visual spatial abilities, motor skills, creativity, and attention. (Supervision may be required due to small pieces). 5 Second Rule Jr is an exciting and fast paced board game that requires a quick reaction time, logic, and reasoning to play. The goal of the game is to answer different questions within a 5 second time frame. Logic Links is a puzzle game where players have to follow clues to arrange the colored chips in the correct order. The puzzles range in levels of difficulty. Logic Links helps develop problem-solving, deductive reasoning, and working memory. Dash the robot can easily be programmed to follow various commands and to perform novel tasks. Playing with Dash is a fun and simple way to introduce kids to tech and coding. Purchase Dash alone or with fun accessories to maximize learning. Learn to perform new magic tricks while exploring static electricity, reflections, optics, pressure, and perception. 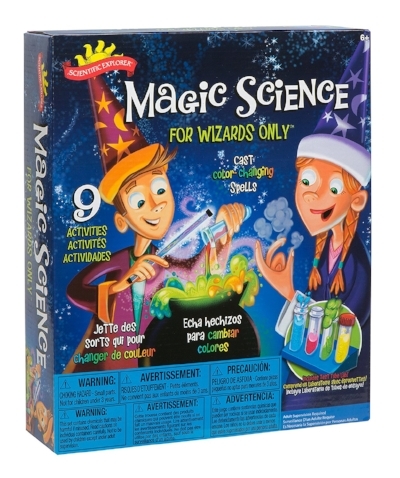 This set comes with an easy to follow guide and supplies for kids to practice being a magician. Assistance may be required.